If his name sounds familiar, that’s because he was in the news a lot last year. President George W. Bush nominated Philip S. Goldberg as Ambassador to Bolivia and his nomination was confirmed by the U.S. Senate on August 3, 2006. On September 10, 2008, the Bolivian Government expelled Ambassador Goldberg, after declaring him Persona Non Grata. As an aside -- there is a long list of alphabet soup at the State Department. But the Bureau of Intelligence and Research (INR) is one of the dozen or so offices that reports directly to the Secretary. According to the Historian’s Office, An Act of Congress (P.L. 99-93) of Aug 16, 1985, authorized the appointment of an Assistant Secretary of State for Intelligence and Research. Prior to this date, the Secretary of State designated all Directors of the Bureau of Intelligence and Research. Since Aug 1986, all incumbents have served as Assistant Secretaries of State and been commissioned by the President. 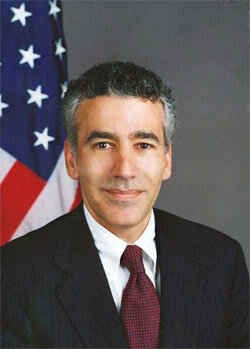 If confirmed Ambassador Goldberg would succeed, Randall M. Fort who was appointed A/S of the INR Bureau from 2006-2009. Previous appointees to this position are listed here.